Wed., May 4, 8 p.m.: Endangered Blood Record Release Concert with the Dan Weiss Trio, featuring Jacob Sacks and Eivind Opsvik. 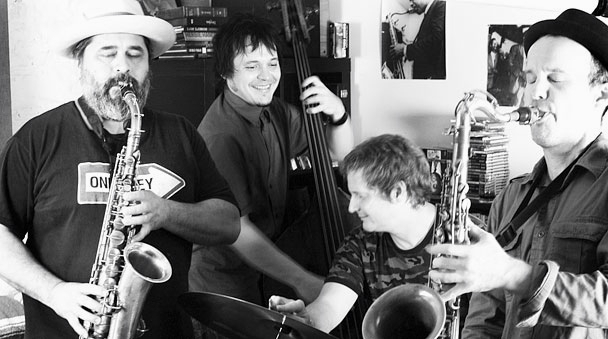 Oscar Noriega (alto saxophone and bass clarinet), Trevor Dunn (bass), Jim Black (drums) and Chris Speed (tenor saxophone), carry on the genre-pushing experimentation of bands like Alas No Axis, Human Feel and Electric Masada (all of which include EB members). Longtime friends and collaborators Chris Speed and Jim Black should need no introduction to fans of cutting edge music. Trevor Dunn is one of the top bassists of his generation, known both for his legendary avant-rock band Mr. Bungle and for his extensive work with John Zorn and Mike Patton. Multi-reedist Oscar Noriega’s relationship with Speed and Black stretches back over 20 years. Awareness of his role as an underground force in the New York jazz world is rapidly expanding due to his recent work with Paul Motian, Banda de los Muertos and Tim Berne’s new quartet Los Totopos.